If you spend hours behind the wheel it is important to be comfortable to avoid musculoskeletal problems related to driving. If you drive for a living, it is crucial to get your posture right and follow some easy tips to keep your body healthy and prevent workplace injuries. Let's get your position right first. 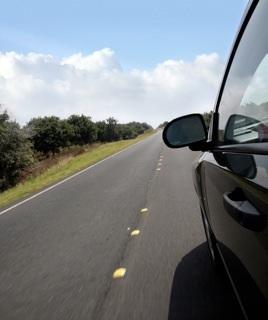 There are two factors to consider when getting into position for driving. The position must be comfortable so that it can be maintained throughout the journey and to avoid gradual onset of problems such as low back pain. The position must accommodate all the body movements required for safe and efficient driving. Slide the seat away from the steering wheel completely. Recline the back rest to about 30 degrees from vertical. Lower the seat cushion at the front edge. Place the steering wheel in its highest and most forward position. Release the lumbar support to its "backed off" position. 2. Raise the seat as high as possible to maximize your vision of the road without causing your head and neck movements to be restricted. 3. Move the seat forward until you can easily depress the clutch and accelerator pedals. You may also need to raise the seat to allow good pedal control. 4. Tilt the seat cushion up or down to support your thighs along the length of the cushion. 5. Adjust the back rest so that it supports the full length of your back, right up to your shoulders. 6. Adjust the lumbar support to fit the curve of your lower back. There should be even pressure along your spine, with no gaps. If your vehicle doesn't have a lumbar support you may need to use a lumbar cushion. Your Physical Therapist can help you choose a cushion with a good shape for your spine. 7. Lower the steering wheel and move it towards you for easy reach. When your hands are positioned at "ten o'clock and two o'clock" your elbows should be slightly flexed. Check that you can still see the display panel and that your legs are clear of the wheel when you use the pedals. 8. Adjust your head rest so that the top of the rest is level with the top of your head. In the event of an accident, this will minimize whiplash injury. 9. Adjust the mirrors so that you can use them without straining your neck or body. Check that the overall position does not strain any part of your body. If your vehicle has a seat position memory function, set it so that you can easily repeat your position of comfort each time you switch drivers. Note: Cloth seat covers are best for preventing slipping into slouched positions. No matter how good your posture is, if you stay in one position for a long time, there is potential for discomfort and injury. When you are not moving, the blood supply to the muscles reduces and over time your muscles become tired. This makes it difficult to maintain correct posture, and your body is not ready for action. Movement or activity after sitting for a long period of time is often associated with injury since the body is not "warmed-up" for the action. People who perform deliveries can be at particular risk if they have been sitting for an extended period, then get out of the vehicle and lift a delivery item. Small movements and regular shifts in body weight can help your body maintain circulation throughout the body during driving. In addition, it is important to get out of the vehicle on a regular basis for a quick walk and stretch break. For example, for every 2 hours spent in the drivers seat, get out and have a two minute walk around the vehicle followed by stretching as shown below. You may need more frequent breaks if you are uncomfortable, or have a history of musculoskeletal problems that are aggravated by driving. Your Physical Therapist will be able to develop a "stretch break" plan that is just right for you. This is particularly important if you have a history of back problems or are susceptible to discomfort brought on by driving. If you have a healthy back you may like to try the exercises below to help you stay comfortable should you have to drive for long periods of time. 1. Take a walk for a minute or two to increase your blood flow to your muscles. 2. Lateral flexion of the spine stretch. Hold stretch for 30 seconds. Repeat each side twice. 3. Back extension. Hold stretch for 10 seconds. Repeat 3 times. Minimize exposure to whole body vibration. Whole body vibration is the jolting and shaking of the whole body. Vibration caused by driving on unsealed, rough road surfaces or from the mechanics of the moving vehicle, can be transferred to your body through the seat. Low levels of vibration that usually occur while driving domestic vehicles on sealed roads are of little risk to your body. However, high levels of vibration, such as those experienced by operators of heavy machinery and vehicles, may present a greater risk of low back pain or other health problems depending on the amount of time per day the driver is exposed to the vibration. Whole body vibration exposure should be minimized by planning work carefully. Sharing the workload between colleagues or alternating driving with other tasks to evenly distribute the daily vibration exposure, and taking more frequent "stretch breaks" can reduce the risk to your body. 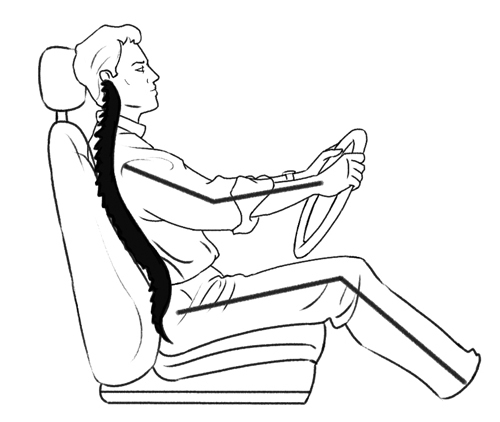 Good driving posture is particularly important when whole body vibration is high. Your spine is able to absorb shock better when it is in a "neutral" position, with the curve of the lumbar spine maintained, than in a slouched, flexed lumbar spine position. Other controls for whole body vibration include adjusting your driving speed, for example slowing down to drive over bumps, modifying road surfaces, keeping your vehicle, tire and suspension systems correctly maintained, and ensuring the correct seat is installed for the vehicle should the seat require replacement. Pictured: The "neutral" spine while driving.